“Mom… I don’t want to fall sick like Didi!” said my slightly scared younger daughter of five, when she saw her elder sister come back from school with a full blown rash of chicken pox and high fever, fourteen years ago. This was the time when chicken pox vaccine had just come into the market and its efficacy was still a concern. Through my experience with eruptive fevers and a little bit of anticipation, I put her and the rest at home on a preventive dose all through my daughter’s illness. I was sure that Homoeopathic preventive will help the rest but was slightly skeptical about my younger one, as it was next to impossible to keep the two years apart siblings away from each other, for long. In addition, I did take the usual precautions to avoid the spread. Not only did she not contract chicken pox in those 15-20 days, but the entire season! In innumerable cases of chicken pox that I have treated effectively with Homoeopathy, in addition, a preventive given to all the other members of the family in the very initial stages (when the fever/pox rash has just appeared), spread of the disease could be successfully prevented. Chickenpox, also called Varicella, is a highly contagious viral disease, leading to rash in the form of itchy blisters all over the body. It is caused by Varicella-Zoster Virus (VZV), belonging to the family of herpes viruses. The same virus causes Herpes Zoster (shingles) in adults. In response to this virus, the body’s defense mechanism produces antibodies that remain in the body throughout life, and provide lifelong immunity against the disease. It is always better if an individual gets the infection during childhood as the chances of a recurrence are minimized, though this is not impossible. Chickenpox is a common childhood disease with peak age at 5-9 years. But when people catch it for the first time as adults, the disease tends to be more severe. The early symptoms of chickenpox are just like any other viral illness. There is fever, loss of appetite, headache, nausea, tiredness and malaise – a general feeling of being unwell. A characteristic rash appears as red bumps within 24 hours of getting fever. It usually begins on the torso (chest and back) and spreads centrifugally to involve the face, scalp, and the extremities. The rash quickly turns into fluid-filled blisters/vesicles in a couple of hours, giving a look similar to “dewdrops on a petal”. These blisters may even form in the mouth, on the scalp or the eyes. 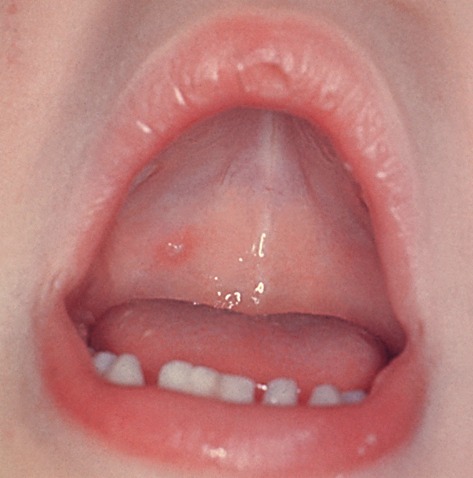 At times, the vesicles in the mouth are the first sign of chickenpox. The rash and the blisters are extremely itchy. In the next four to five days the blisters break open and form scabs/crusts, which fall off after about one to two weeks. The marks take some time to fade away. Skin manifestations are only a third of the burden of the illness. Chicken pox can affect anything from the gut, lungs, eyes, kidneys and even the brain. Complications may occasionally include pneumonia (inflammation of the lungs), encephalitis (inflammation of the brain), or bacterial infections of the skin among others, the incidence being more in adults. Between 30% and 40% of the adult patients require admission. Shingles affects one in five adults, who were infected with chickenpox as children, especially those who are immune-suppressed, particularly from cancer, HIV, stress or other conditions. Who are at a higher risk? One who has never had chicken pox before, or has not been vaccinated against it. Those with underlying medical conditions such as diabetes, blood pressure, chronic kidney ailment, HIV or tuberculosis. The disease can be very severe in immunocompromised patients e.g. in patients with cancer and can even lead to death. Older patients above 60 years. If it occurs during pregnancy, there are 25% chances of transmission of the virus to fetus. If it occurs in first half of pregnancy it will lead to fetal varicella syndrome characterized by scarred skin, limb defects and eye defects. If it occurs in 2nd half of pregnancy, the child has chances of developing herpes zoster at an early age. If it occurs within 21 days of delivery, there are 25% chances of newborn developing chicken pox. The disease has a prodromal period of about 14-21 days, i.e. if someone is infected today, he or she will start getting the symptoms around two weeks after the exposure. How does one contract chicken pox? The disease is highly contagious. The virus spreads through the air via infected droplets emitted from the nose or mouth, if someone with the infection coughs or sneezes near a healthy person. Touching the fluid from a chickenpox blister, or saliva of the infected person can also spread the disease. One can also contract it indirectly by touching contaminated items of the infected person such as clothing, linen or towels. Direct contact with the blisters of a person with shingles (Herpes Zoster) may spread chickenpox to those who have never had chicken pox and have not been vaccinated against it. Chickenpox is contagious for approximately seven days during a person’s period of infection. 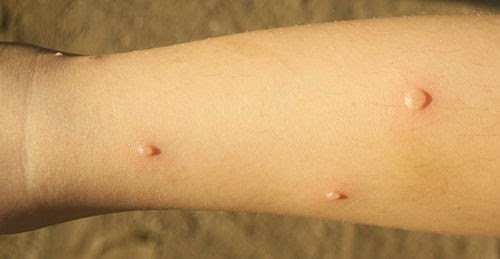 Contagiousness begins about two days before symptoms appear and continues until all blisters have formed scabs. It is advisable to keep the infected person isolated from others during those seven days. 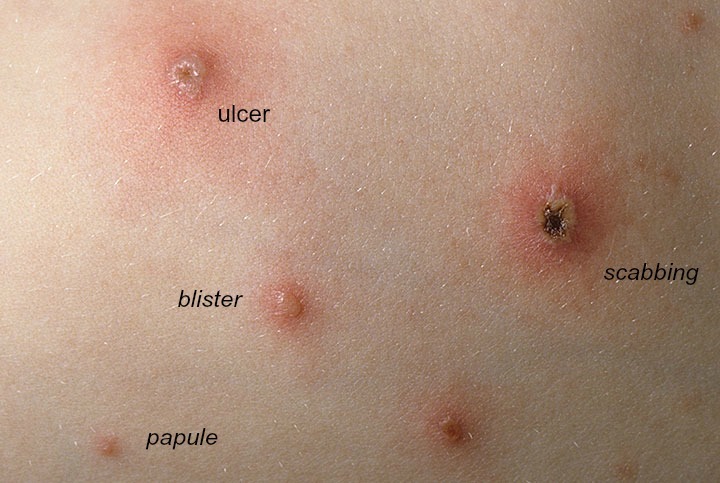 Blisters that are dry and crusted are no longer able to spread chicken pox. Though it has now become an annual disease, the chickenpox virus spreads fast and thrives in summer or when there is a season change. It is most dreaded by parents as the infection period is almost 10 days causing the kid to miss school for a lot many days. Earlier there was no specific treatment for chickenpox, but these days certain anti-viral drugs are available that minimize its magnitude. The disease is mostly treated at the symptomatic level, to reduce severe itchiness and bring down the fever. Bed rest, acetaminophen for relief of fever and discomfort, and lukewarm baths and application of topical medicines such as calamine lotion to soothe the itching. Excessive scratching can cause infection of blisters, which can lead to scarring and thus needs special attention. The Varicella vaccine costs about 1,500-2000 INR per shot and is the widely used protection against chickenpox. However, due to higher cost it is not feasible for everyone to use it. It’s not a part of the national immunization programme purely because of the cost and also because the disease normally is not of a very serious nature. The vaccine is good for those who can afford it, otherwise it should be given mainly to high-risk people. It is given subcutaneous over left arm or thigh and can be taken at any age. It’s safe and effective. It is given to children at 12-15 months of age. They receive a booster shot at 4-6 years of age. In older children and adults who have not had chickenpox, 2 doses are given at 6-8 weeks interval. It takes about two to three days to develop immunity against the disease after the vaccine, hence, it is important to take the vaccine shot immediately after a near one has developed symptoms. Chicken pox vaccine has a 10-15 % failure rate. Chicken pox is a communicable disease. Since the virus spreads through air when an infected person coughs or sneezes, it is important not to be too close to an infected person. The patient should be isolated to the maximum extent possible. Coming into direct contact with the blisters or using or touching clothes or towels of an infected person need to be completely avoided. While many of you might have already contracted the disease in your childhood, for those who haven’t, the prevention lies in your own hands… well, literally. Avoid going to over-crowded places and areas with poor hygiene conditions, but if unavoidable, remember to disinfect your hands before eating or even otherwise. Patients are infectious from two days before the rash appears so even if your friend or colleague may have gone on sick leave, you may contract the infection through common platforms like the electrical switches, computer keyboard, door knobs, stationary etc. Eat healthy to boost your immunity. Pack your meals with loads of greens and fresh fruits. As a thumb rule, never leave home without having breakfast because when your stomach is empty, your immunity is the weakest, and you are prone to contracting diseases. Take an adequate sleep of at least eight hours. Homoeopathy is well known for treating all kind of viral illnesses effectively. The potentized remedies – Aconite, Antimonium crud, Antimonium tartaricum, Apis, Arsenic alb, Rhus tox, Kali mur., Pulsatilla, Belladona, Sulphur, Merc Sol, etc can not only reduce the intensity of the disease but also cut short it’s duration and minimize complications. Homoeopathic medicines are also good prophylactics, i.e. they can help prevent you from contracting diseases like chickenpox, measles, mumps, herpes etc in the most gentle, efficient and economical way especially if you are not vaccinated and are living in close proximity of an infected person, or are travelling to an area where the infection is prevalent and your travel is unavoidable. Homoeopathy can give you a short term immunity for a season and the dose needs to be repeated the next season. You are put on an oral medication and not an inject-able.